I have used this song in an earlier post on Jean Racine and his Phèdre (1677) entitled Jean Racine, Gabriel Fauré & Alexandre Cabanel: a Canticle. Phèdre is a dramatic tragedy, in five acts, written in alexandrine verse (twelve syllables). It was first performed on 1 January 1677 (see Phèdre, Wikipedia). Racine’s Cantique is not part of Phèdre, perhaps the best known of Racine’s tragedies and, officially, his last play. Racine’s Phèdre is about love and jealousy. In certain seventeenth-century works of literature, jealousy is the feeling that reveals one is “in love.” Love is therefore looked upon as dangerous, because jealousy can be an extremely painful feeling. The foremost literary expression of this phenomenon is Madame de la Fayette‘s novel entitled La Princesse de Clèves, published anonymously in 1678. It is considered a masterpiece of Western literature. This post is not about Phèdre, except indirectly. 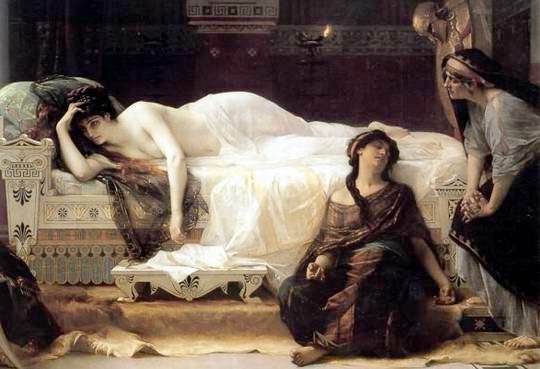 I am using images related to Racine’s Phèdre, whose plays, tragedies, are rooted in Greco-Latin models or mythology. However, Racine’s tragedies usually convey a meaning not entirely intended in the Greco-Roman “model.” Moreover, Racine’s plays are examples of works of literature that were considered as well written as their source. The literary maturity of seventeenth-century French literature triggered the famous Quarrel of the Ancients and the Moderns. 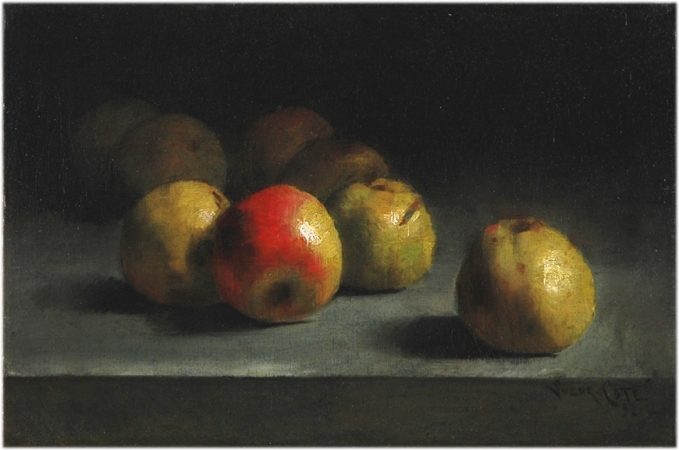 As we neared the end of the seventeenth century, many claimed that the modern work of literature was at least as fine as the Greco-Latin “model,” which was often the case. Jean Racine‘s Cantique is a translation and a paraphrase (a rewording) of an earlier text. Set to Gabriel Fauré‘s music, it nearly becomes what the romantics, nineteenth-century authors, artists, musicians and critics, would call the “sublime.” Gabriel Fauré (12 May 1845 – 4 November 1924) set Racine’s Cantique to music when he was nineteen-years old. A canticle is a song of praise taken from biblical texts other than the Psalms (Wikipedia). Magnificats, hymns of praise, are canticles. Racine’s text is a translation and a paraphrase of Consors paterni luminis. It is part of Racine’s Hymnes traduites du Bréviaire romain (Hymns Translated from the Roman Breviary), published in 1688. I have recycled images used in my posts on Racine’s Phèdre. Phèdre’s husband slew the Minotaur, the offspring of Pasiphaë, Minos’ wife, and a bull. The Minotaur’s father may be the Sacred Bull. The Bible’s Golden Calf is an example of the worship of bulls, calfs and cows. Pictured below is the Bull of Knossos, or the Cretan Bull. The Minotaur‘s mother is Pasiphaë, Phèdre’s and Ariadne’s mother. The Minotaur was slain by Theseus, Phèdre’s husband, who used Ariadne thread to find his way to the Minotaur through the labyrinth built by Daedalus, who crafted sadly-remembered wings for his son Icarus. However, let us focus on Gabriel Fauré’s (op. 11) musical setting of the canticle translated by Racine. Bulls will be discussed elsewhere. They were worshipped in Egypt, so it’s a long story. By and large, we no longer worship bulls and bull-leaping is antiquated, but we do have bullies a-plenty. Best regards to all of you: my family! Qui la conduit à l’oubli de tes lois ! Et de tes dons qu’il retourne comblé. Saviour Divine, cast your eyes upon us! That brings forgetfulness of your laws! May they go forth filled with your gifts. For translations of the “Cantique” in languages other than English, please click on translations. You will find the original Latin text in Wikipedia’s entry on Cantique de Jean Racine (Fauré). Jean Racine (22 December 1639 – 21 April 1699) is the foremost dramatist (tragedy) of 17th-century France. Racine is best known for his tragedies the most powerful of which may be Phaedra EN (Phèdre FR) which premiered 1 on January 1677, at l’Hôtel de Bourgogne, the best venue in Paris. In Racine’s tragedy, Theseus, Phèdre’s husband, has a son by a previous marriage, Hippolytus. During a lenghty absence, it is reported that Theseus has died. Phaedra, who has fallen in love with Hippolytus, tells him she loves him. Hippolytus is horrified. However, Theseus has not died. When he returns home, a jealous Phaedra—she has learned that Hippolytus loves Aricie—tells Theseus that she was seduced by Hippolytus. Theseus calls on Poseidon (Neptune), who has promised to grant him wishes, and asks him to avenge him. A monster comes out of the sea and kills an innocent Hippolytus who is riding on a horse. Guilt-ridden Phaedra commits suicide. Racine’s play is based on Euripides’s Hippolytus, but Jean Racine’s play is the work of a writer who views love as devouring passion. Jean Racine’s Phèdre is a Gutenberg publication. As for Gabriel Fauré‘s Cantique de Jean Racine, it was composed when Fauré was 19. The text itself is a paraphrase, by Racine of a Medieval hymn entitled Consors paterni luminis. In Racine’s paraphrase (see below) God seems distant as He also seems in Phèdre. This hymn is sung at the beginning of Matins, the Canonical Hour that ends as day breaks. Set to Fauré’s music, the meaning of the text, an almost despairing hope that God “notre unique espérance” (our only hope) will have mercy on powerless humanity is expressed in a poignant yet resigned manner. Fauré’s Cantique de Jean Racine is the centrepiece of this post. Our featured artist is Alexandre Cabanel (28 September 1823 – 23 January 1889), an academic painter. He won the Prix de Rome and was awarded the Grande Médaille d’Honneur at the Salons of 1865, 1867, and 1878. In 1863, Cabanel was elected a member of the Institute, founded on 25 October 1795, and appointed professor at the École des Beaux-Arts. Cabanel’s art has been described as art pompier (pompous), but his portrait of Phèdre is exquisite and renders her inability to fight a fatal love. She looks powerless. 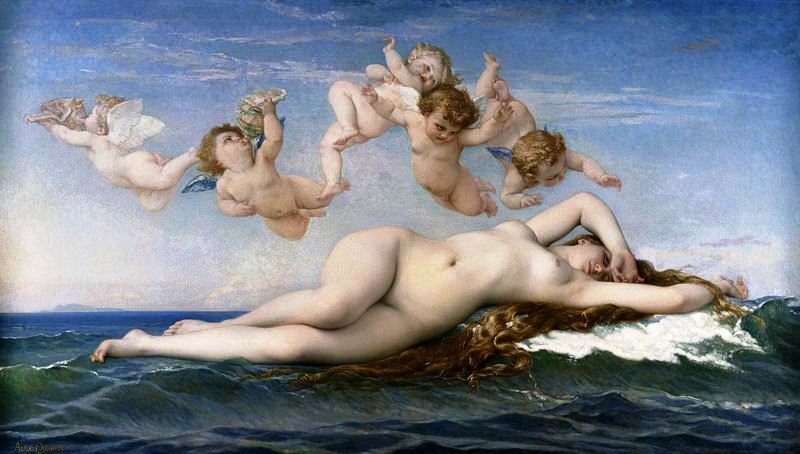 Cabanel’s most famous work is The Birth of Venus, 1863, housed at the Musée d’Orsay, in Paris. I have not provided an English translation of Racine’s Cantique. However, translations of the canticle are available, in several languages, at ChoralWiki (simply click). Divin Sauveur, jette sur nous les yeux ! Et de tes dons qu’il retourne comblé ! Well, many years ago, one of my students commented that studying Jean Racine‘s Phèdre was not important. I told her that sub specie æternitatis, studying Phèdre was not important and that, in fact, despite what psychologists tell us, we are both important and not important and then asked the class to look out the window. We could see a cemetery in the distance. They did and then returned to their respective chair. It was a small class of about twelve students, a nice mixture of people. So, to continue the narrative, I invited them to discuss the idea of “importance” as it was an “important” idea and, therefore, that it had to be addressed. Our discussion of Phèdre would simply have to wait. Suddenly, they turned into “philosophers.” You’ve no idea how impressed I was. I had of course withdrawn into the role of moderator. When the class was over I thanked them for what had been a great discussion. They had spoken about relativity. What was important to one person was not important to another. Some like tea, some prefer coffee. But, but more importantly, they had talked about the big questions: life and death. I ended up telling them that, for me, what was important was to give meaning to my brief journey on earth and make it pleasurable, not only for me, but also for those who are journeying with me. Some will like my posts and some will not. It depends on my reader’s tastes, needs, and goals in life. As for seventeenth-century French literature, one reads Phèdre and/or another play by Racine. He is one of three major playwrights in seventeenth-century French literature. Racine is on the programme and in the context of the course, Phèdre is important. I had to teach Racine. I have fond memories of my students.